Cage cups for providing food and water. Mounts on any trap or transfer cage. 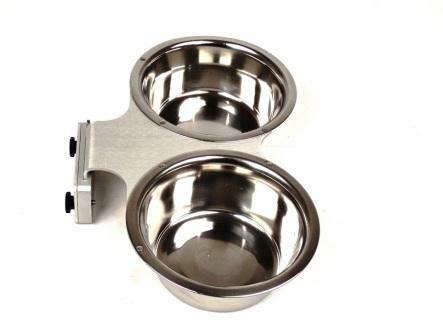 Kennel-Gear stainless cage cups come with a bowl and Kennel Bar Mount system. This allows you to attach the bowl to kennels, cages, traps, chain link fences or solid surfaces (solid surface attachments do not require the thumbscrews or back plate). Once the Kennel Bar Mount has been installed the bowl can easily be inserted into the mount and also removed.